In seeking for a good quality of suppliers or vendors, especially for a government office, such a process has to go through bidding. As a requirement, a Proposal Form is crafted to invite prospects whom a particular government office is confident will promote a good business relationship with the intended organization. This form outlines specific details as to the type of business, the schedule, payment terms, as well as delivery dates. This form also serves as the basis for all participants to take note of the implementation of rules and regulations. 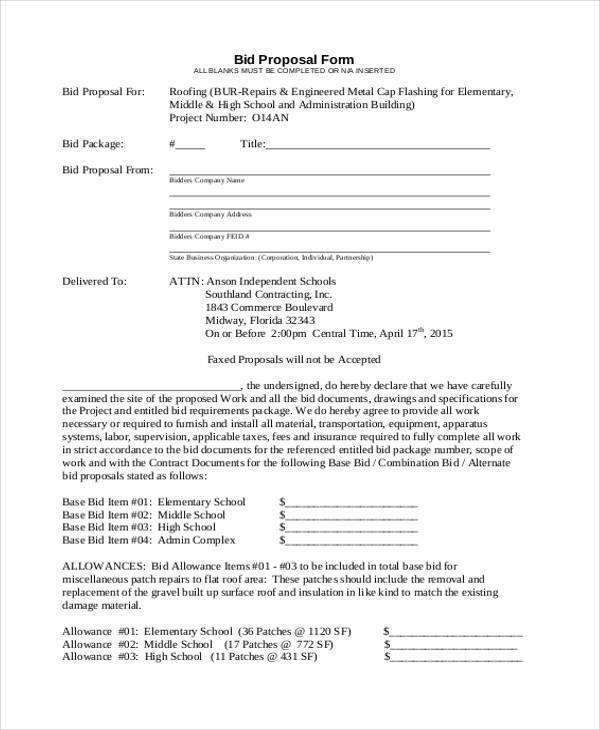 It also requires detail of the bidder such as name, address, and contact information. A person or a company that wishes to do business with another person or company on a contractual basis is called a contractor. It can be for production of certain goods, equipment, and material, or even for rendering a service. Before entering into a contract, Contractor Proposal Forms need to be drafted and submitted to the organization or institution it wishes to do business with. This form specifies all necessary information the proposer wishes to convey in order to get a favorable response. From the types of products or services it offers, to the amount it expects to get in return, to the limitations of how a particular business transaction should be carried out – all these should be included in the form. Through this form, it is made clear that no certain amount of obligation has been entered into yet by both parties. The type of products or services being offered should also be indicated to avoid confusion, especially on the side of the recipient. Major corporations that plan to establish their own office building, or a government office that plans to improve the quality of a certain piece of infrastructure, or a family that wants to build a house will definitely search for a reliable construction partner. These construction firms will then submit their Construction Proposal Forms, which is basically putting into writing their intent of doing business or offering their services. This form can also be used to gather information about the individual or organization whom it plans to do business with. In return, the proposer will provide all information necessary to carry out the business. Once both parties agree to all the conditions that have been discussed, the proposer will then take the responsibility of carrying out the task. This form will be legally binding since both parties should later be expected to enter into a contract. You can download samples of these forms right here, and these will give you ideas on how to create a short yet detailed Proposal Form to save you time and effort.